We continue to bring to your attention promising Latin American countries in terms of making money on termination. What makes Paraguay attractive is the well-developed mobile market. The cellular penetration reached 113%, which is about 7.6 million connections, with a population of more than 6.8 million. The average rate is $0.06 per minute, which allows you to make $100 per channel, terminating traffic. 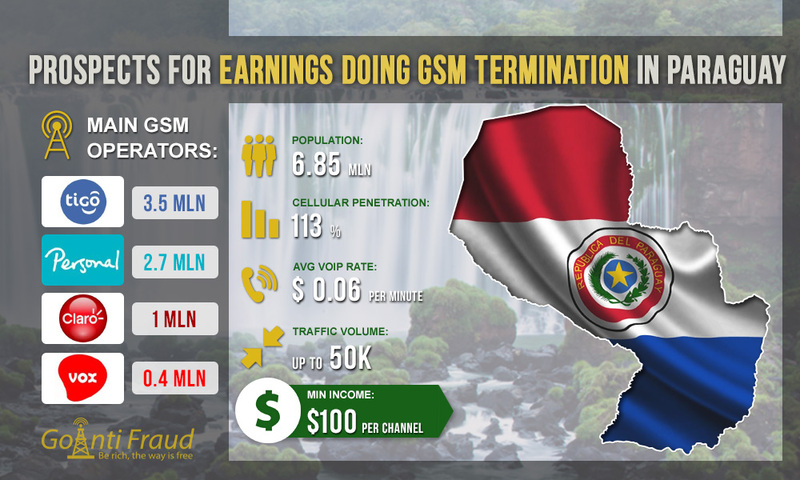 Today, in the cellular communications market in Paraguay, there is an active competition among 4 GSM operators. Telecommunication companies took advantage of opportunities to promote mobile services in conditions of poor fixed-line infrastructure. There are 18 mobile phones for every fixed line in the country, which is the highest figure in the Latin American region. The market leader is Tigo, which owns half of the mobile sector. Personal provides one-third of all connections. The remaining 2 GSM operators have less coverage of the market but their services are also in demand. As for SIM-cards, in Paraguay, they are very cheap. The cost of the starter package varies from 30 cents to 1 dollar. In 2017, the Paraguayan government passed a bill that requires you produce documents and fingerprints when buying prepaid SIM-cards. Nevertheless, you can purchase starter packages through dealers or by contacting street vendors. Local operators offer advantageous tariffs on local calls. There are many unlimited offers for prepaid customers. Cheap cellular communication and good voip international calls rates combined make it possible to turn a useful penny by doing GSM termination in Paraguay.